Two types of programs are offered to suit the requirements and convenience of the student community: Full-Time and Part-Time. Full-Time Program: This is a three-year full-time program with two annual semesters beginning in June and November. This program is designed to be residential for International students and/or non-residential for citizens of India. Each semester is approximately 110 days (June to October) and 110 days (November to April). 300 Hours/20 Credits per Semester, 600 Hours/ 40 Credits per annual Academic Year. Part-Time Program: This is a modular program of 46 days each, offering the same syllabus and study hour requirements and credits as the full-time program. (Daily 6 1/2 -Hr classes for 46 days per module during the notified dates). 300 Hrs/20 Credits per module. Lakulish Yoga University offers Diploma, Undergraduate, Graduate and Ph.D. Degrees in Yoga Education. Lakulish Yoga University is a legalized University established through a bill passed by the Legislative Assembly of the Government of Gujarat and is accredited by UGC (University Grants Commission.) UGC was established in 1956 as a statutory body of the Government of India through an Act of Parliament for the coordination, determination and maintenance of standards of university education in India. Lakulish Yoga University is fully recognized by the Government of India and is on the official list of approved and recognized Universities at all Embassies across the World. The certificates and degrees received by Lakulish Yoga University are authenticated and recognized internationally just like those recognized state and private Universities in the USA. The Bachelor’s Degrees in Yoga Education (B.Y.Ed) is three academic years, six semesters, 1800 Hrs. and 120 Credits in total. Each semester is 300 hours, totaling 20 credits. Students will have the opportunity to apply both theoretical and experiential (practical) methods in studying Yoga under both Majors (Streams). To equip students with the highest level of values by teaching the importance of ethics, morals, and culture in order for students to contribute in making society stronger for the well-being of mankind. To train students as Yoga Teachers, Yoga Therapy Instructors, and Paramedical Personnel in hospitals and nursing homes as well as to introduce IAYT (Integral Approaches of Yoga Therapy) under the guidance of doctors. To equip students with the skills and abilities needed to run their own successful Yoga Studio/Centers. To train students to promote holistic health practices through yoga and yogic techniques that can also be introduced into schools and communities. 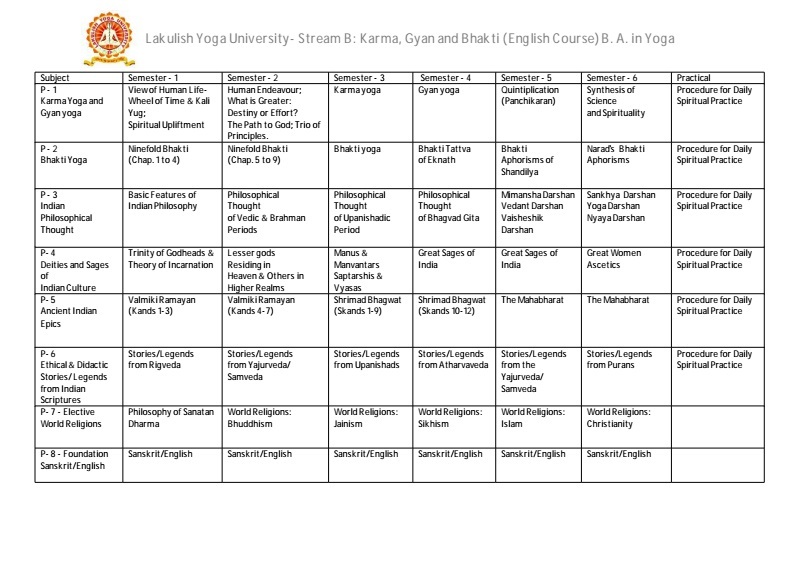 The following is the curriculum for the Bachelor’s Degree in Ashtanga Yoga. * Please note: Curriculum is subject to change without notification. Please visit www.lyu.ac.in for latest information. The Karma, Gyan and Bhakti Yoga Bachelor’s Degree program offers student the unique opportunity to learn from and study about the world’s most ancient scriptures. This course includes topics such as the Laws of Karma, Bhakti (Devotional) Yoga, Indian Philosophy, Concepts of Time and Space, Evolution and Involution, Indian Epics, Ethical Stories from Scriptures, and much more. Students will also get the opportunity to learn how to conduct Daily Spiritual Practices/Rituals (Nitya Karma) in their own life including Pratah Karmas (Morning Duties), Sankalpa, Pooja, and Yagya. The Lakulish Yoga University Constituent Center at Jakhan is the home of our Higher Studies and Research Academy. The campus which is approximately 120 acres in total has all the teaching and research facilities, technology and full library to meet the requirements of any Graduate Student or Researcher. Doctorate degrees in Philosophy are graduate studies with a minimum of three years and include a dissertation. Doctorate Degrees are awarded for original contributions of knowledge and research. There are two levels: Each level is 45 days/ 250 hours and is Teacher Certification Course through the University. Students must pass Level 1 in order to be accepted into Level 2. At the end of the course, students will appear for written theoretical tests as well as practical tests which include teaching demonstrations. Successful candidates are awarded Certification as a Level 1 or 2 Yoga Teacher. LYU Yoga Teachers have global recognition as Prime Minister, Narendra Modi, (who was Chief Minister of Gujarat at the time) had inaugurated the University when it first opened in 2013. Short 10-Day Courses are offered at both Lakulish Yoga & Health Retreat (Mebane, NC, USA) and LIFE Mission Campuses, India. Certificate courses are given by Lakulish Institute of Yoga and are accredited by Lakulish Yoga University. *Yoga Courses for Children & Teens are also available. Please contact Lakulish Yoga & Health Retreat, USA (lifemissionusa@gmail.com) or LIFE Mission (India) (life_mission@hotmail.com) for more information. The University offers Diploma Courses in both Ashtanga Yoga and Karma, Gyan and Bhakti Yoga. Diploma courses are two years. The minimum educational requirement is the passing of 10th grade. The objective of this course is to orient students to develop their career in the field of Yoga to spread this ancient scientific knowledge. The PGDYT Diploma is 18 months and 2 Semester Terms. Students from any field are welcome to apply for this course. To promote positive health, prevention of stress-related health problems and rehabilitation through Yoga practices. To Adopt the Integral Approach of Yoga Therapy (IAYT) to common ailments. To enable students to establish Yoga Therapy centers in the common service of mankind. This 2017-2018 Academic Year, both Stream A: Ashtanga Yoga and Stream B: Karma, Gyan and Bhakti Yoga in the Bachelor’s Degree Program will be offered for students enrolled in our 46- day International Student Program. The Yoga Teacher Training Level 1 Certification Course (YTTC) is offered throughout the year. *For course details see “Courses and Certification Section” and for course fees see “Admission Section”. Please visit Lakulish Yoga University’s website for more information www.lyu.ac.in or email the University at lakulishyogauniversity@yahoo.com Tuition will be $1,280.00 for either the November course or the January course. This fee includes: tuition, university fees, lodging and boarding.